No swim platform? No Problem! 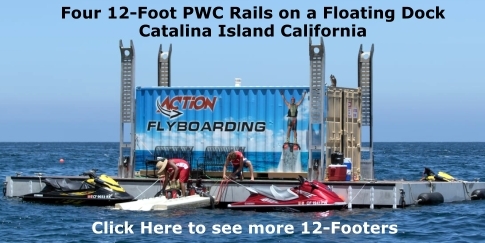 Do you want PWC Rails for your dock or boat house? We can do that! 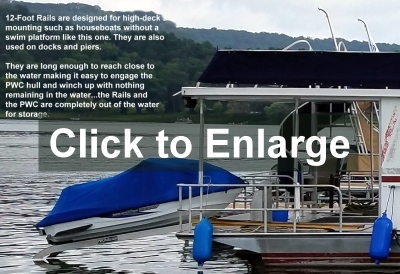 Do you want Rails for your pontoon boat? We’ve got ‘em! Our standard 8-foot Rails are engineered to mount on swim platforms which, by definition, are usually about 8 to 12 inches above the water. The angle of the Rails can be adjusted so that the end of the Rails are close to the water, but not in it, and more importantly, so that the aft-end of your PWC is not touching the water. Modern 3-seater PWC’s are 11 or 12 feet long, so quite a bit of the hull is extending out over the end of the Rails, but high enough to be out of the water. 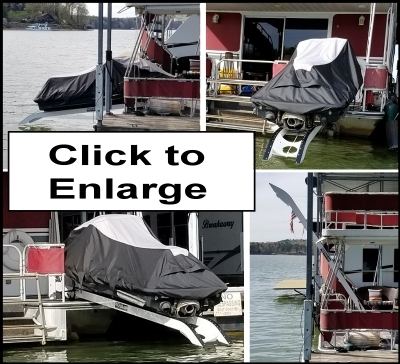 But if you don’t have a swim platform on your houseboat, or if you want to mount our Rails on your dock, boat house, or a pontoon boat, the mounting surface is closer to 24 inches above the water. 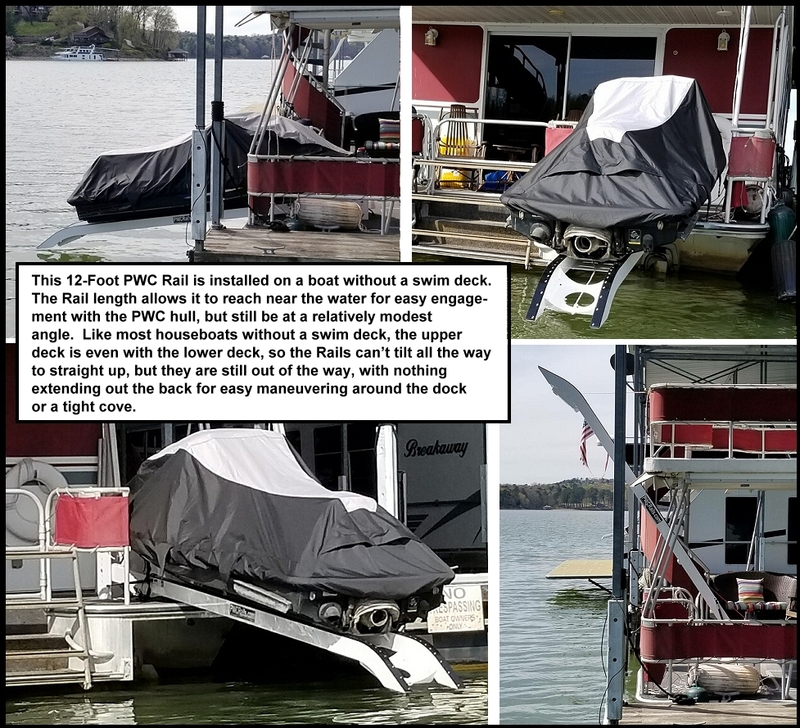 8-Foot Rails won’t work because they have to be too steep to get the entry-end close enough to the water to engage the hull of your PWC…and then the rear of your PWC would be dragging in the water. 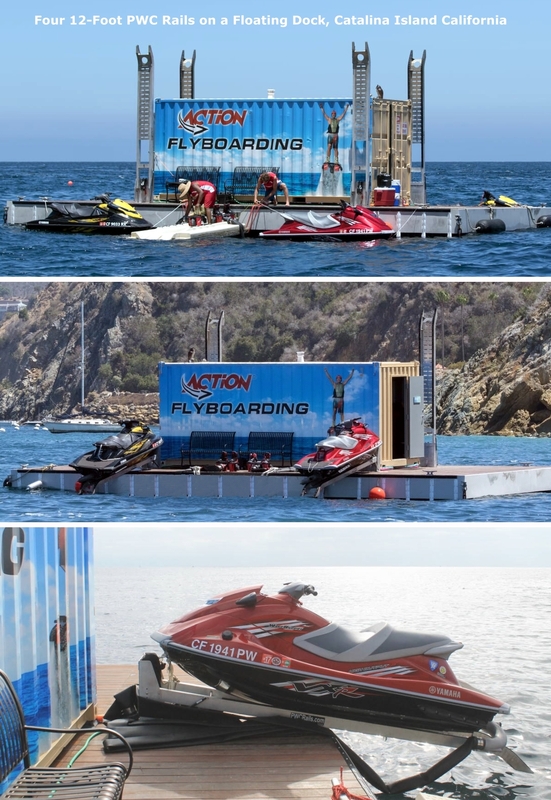 Action Flyboarding has added 4 of our 12-Foot Rails to their floating dock anchored at Catalina Island California. They have 4 PWC's that run their Flyboards. The Rails allow them to load and store their PWC's when not in use. As a bonus, the 12-Foot Rails add a great visual attraction when tilted up. Click on the picture to see more images. If you want to see some Flyboarding pictures, click here which will open in a separate browser windoe. 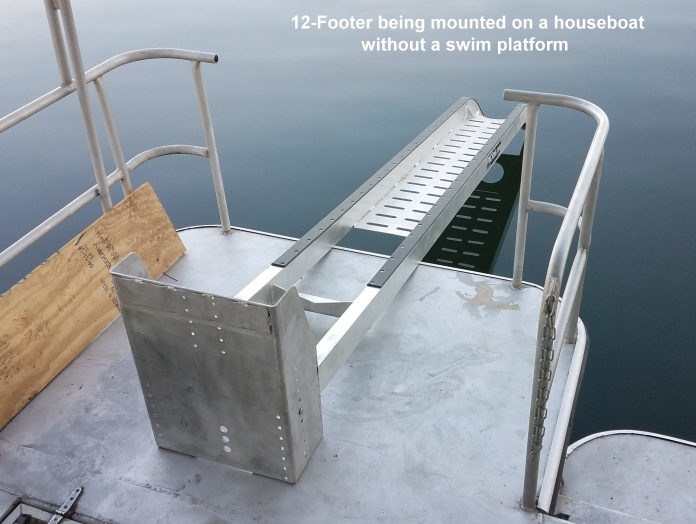 Previous customers without swim platforms have paid over $5,000 to have a swim platform added…plus the cost of removing their houseboat from the lake. But our new 12-foot Rails are a much less expensive way to solve the problem. 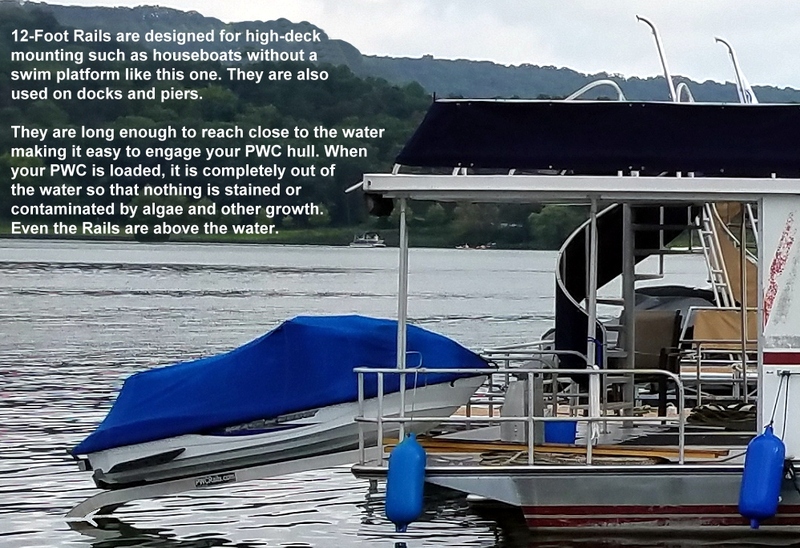 The additional length allows you to mount the Rail Frame up on the higher deck, and to achieve the optimum angle so the Rails and your loaded PWC are not touching the water! The longer Rails are an additional $475 which includes the walk-way between the Rail tubes, and they have to be shipped via overland truck at an additional cost. You will see the longer Rails as an option on the order form. We can quote the additional shipping cost if you tell us the commercial shipping address or marina. 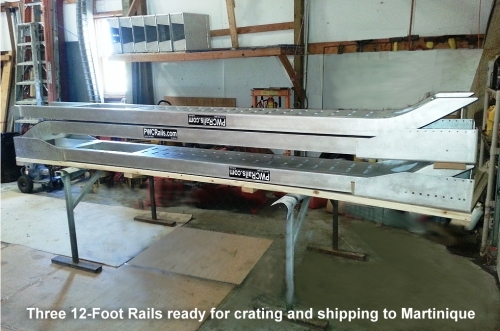 12-Foot Rails cannot be shipped to a residentially-zoned address. Q: How does the Winch Frame mount to the deck? A: There are bolt holes in the bottom of the Frame. You would drill matching holes in your deck and bolt it down to the deck. Q: Can the Rails still tilt up when unloaded? A: Yes. 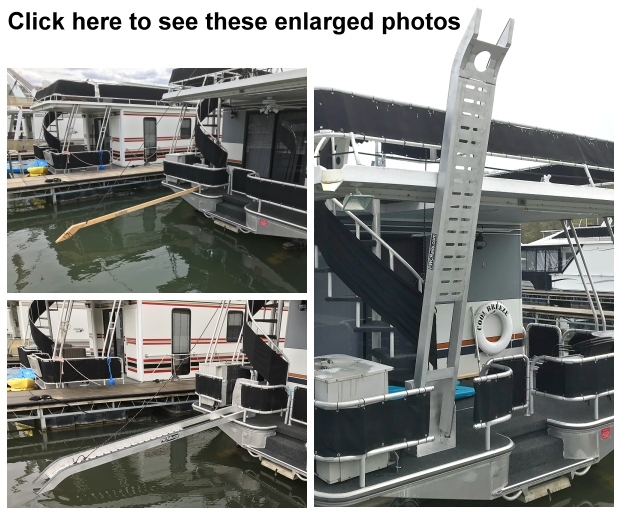 If on a houseboat without a swim platform, they might not go all the way to vertical because of your upper deck, but they will still tilt up enough to make your deck usable and more importantly, so they are not extending out the back while you are maneuvering your houseboat in a cove or around the gas dock. Q: How far from the edge do I need to mount the Frame? A: Ideally, you want to mount the Frame 3 or 4 feet from the edge, no less than 2 feet. If you mount it 2 feet from the edge, that would mean that 10 feet of Rail and almost all of your PWC would extend out over the water. The heavy duty (1/4” thick tubing) Rails will handle all the leveraged weight, but that leveraged weight puts more stress on the floor of your deck to which the Frame is bolted, and it also adds more downward squat on your houseboat. The less overhang the better, but there is a downside to consider. The farther you bolt the Frame from the edge of your deck, the steeper the Rail angle needs to be. You can simulate the angle using a 2x4 as shown in the enlarged photos linked here and above. Q: Will this Rail system work on smaller boats like pontoon boats or fiberglass cruisers? A: This is really 2 or 3 different questions...one relative to the size of the host boat and the PWC's effect on its floatation angle, and another relative to fiberglass construction and its structural strength. We discuss both issues in our General FAQ's. Q: Why is there a "walk-way" between the 12-foot Rails? A: You don't need it on the 8-foot Rails, but it is required for the long Rails. It allows you to walk out to the end of your Rails which makes it easier to connect the rope-hook to your PWC, and also easier to lift the bow of your PWC up into the Rails as you push the winch button. The higher you can raise the bow of your PWC, the more gradual the Rail angle can be, and the easier it is for your winch to do its job. 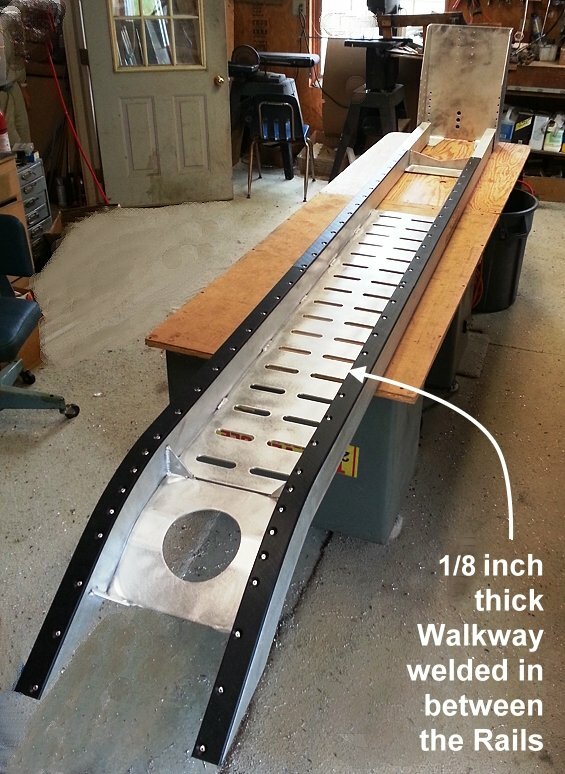 The Walk-Way is made out of rugged 1/8 " thick aluminum with foot-traction cutouts. Q: Are the 12-Foot Rails considered "Heavy Duty"? A: Yes. 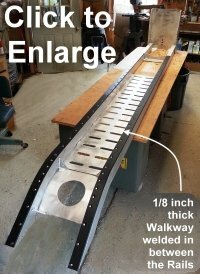 If you order 12-Foot Rails, you must also select the "Heavy Duty" option which is a $200 upgrade. Heavy Duty means the wall-thickness of the tubes is 1/4 inch while Regular Duty is 1/8 inch thick. Q: Can I make the Rails so they tilt lower to the water? A: Yes. Take a look at this video that shows how one of our customers mounted his 12-footer Rails in a tilting frame. This could be done without needing the wood frame...just some brackets on the edge of the mounting surface. If you want to do something like this, let me know and I will help you design it. 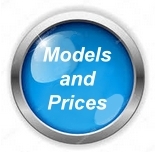 Be sure to take advantage of the discounts available in April shown on the prices and ordering page. If you have any other questions about our PWC Rails, please don’t hesitate to ask. You can call me directly at 937-985-5863 (9 am to 6 pm Eastern USA), or send an email to sales@divnick.com.